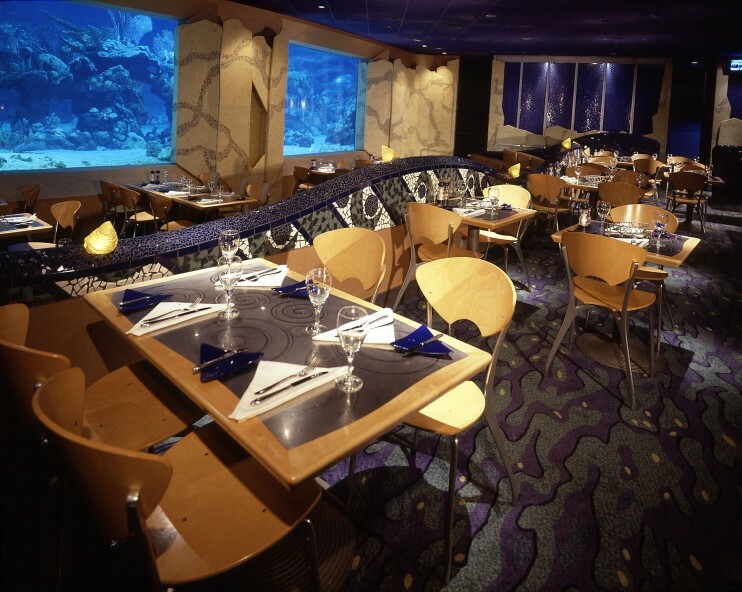 While planning my visit for this past September, I was browsing through different dining options and saw Coral Reef Restaurant. After reading a few reviews and chatting with people who had dined there, I was on the hunt for an Advance Dining Reservation (ADR). Because of my husbands work schedule at the time, I had to mentally plan our trip long before I could make reservations. Once work approved his vacation time, I set to work on the details….did I mention this was a month before the trip? 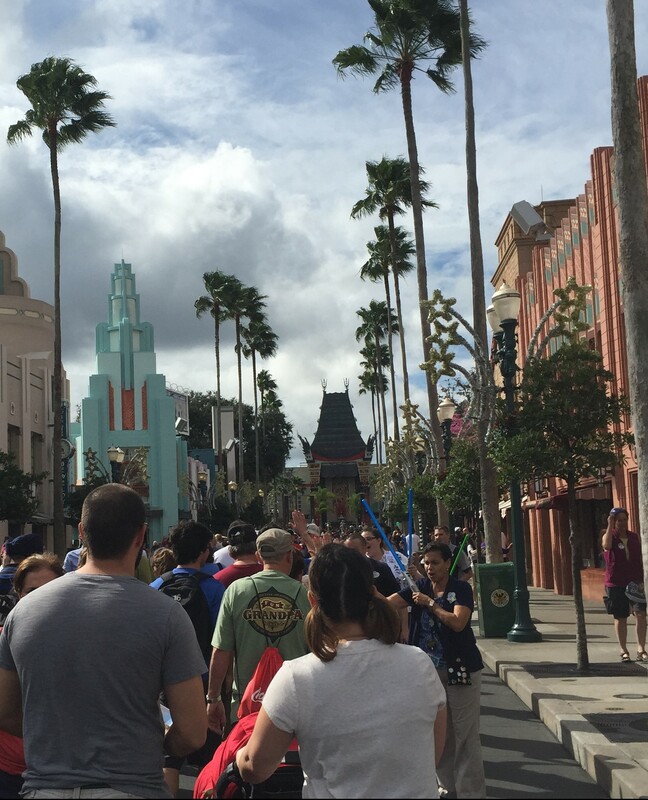 (Let me know if you’d like an article on how to plan a WDW trip last minute. I’m an expert!) The stars must have been aligned that day because I not only got an ADR on the day I wanted, but I made a reservation for TEN guests! The day of our reservation, we were running a few minutes late due to issues with our MagicBands. 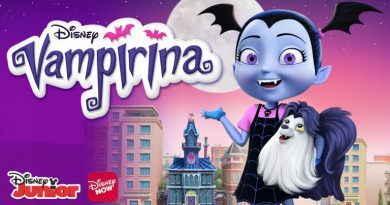 I was told the restaurant would hold our ADR for up to 30 minutes (does anyone know if this is true? ), but was still on the verge of a panic attack as we sprinted through the park. We had come from the Boardwalk, so had quite a hike through Epcot to Future World where the Seas Pavilion is located. The rest of our party was waiting inside the lobby patiently and when the hostess saw us, she smiled and handed over the pager. During our short wait, I looked around and took in my surroundings. Not five minutes later, our pager buzzed signaling the end of our wait, so off we went to our table. The wave-motif theme continued into the dining room in the designs and colors of the carpet and mosaic trim. 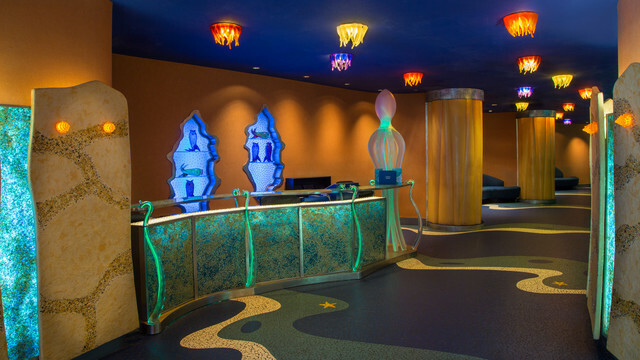 The lighting was dim and, instead of tentacles, the light fixtures were textured and shaped like a seashell. Straight ahead, I saw windows displaying sea life in the 5.7 million gallon aquarium. The entire atmosphere was absolutely beautiful and provided a very relaxing and tranquil environment. As I sat down, I saw cozy booths in addition to the tables within the room. I noticed that no matter where you were seated, there was a perfect view of the marine life. Since we were a party of ten, we were divided into two groups. This didn’t bother me in the slightest as we were right across from each other so we could still talk and interact. I browsed through the menu and saw lots of seafood options. I’m not a seafood person, so I ordered the marinated grilled vegetables but asked if they would give me a grilled chicken breast instead of the vegetarian option. It would be served with black rice, pine nuts and tomato vinaigrette. I was starving and couldn’t wait! Our waiter was delightful and very attentive considering he had ten guests to serve. Our beverages were always full, and I appreciated the fact that he took the time to answer any questions about the menu and understand any dietary restrictions within the group prior to taking our order. My mom is very allergic to seafood (which is pretty gutsy of her to eat at a restaurant where seafood takes up a good chunk of the menu), but felt comfortable with her food choice (chicken) after speaking with the server. When I’m hungry, I can be so impatient and antsy while waiting for my food (just ask my husband!). However, I was quite content to sit and gaze through the windows into the water. We had received a ‘fish guide’ featuring photos of some of the fish swimming in the tank, so we all had a ball pointing out the ones we could find from the list. Our ten-month-old daughter was with us and was mesmerized by the sharks, sea turtle and movement of the seaweed and other plants. My father-in-law brought her close up to the window so she could touch the glass and feel the texture of the mosaic tiles. It was so fun to see the marine life from her perspective. Such wonder and amazement through the eyes of a child. I forget how long we waited for our food as I was busy chatting away and watching the fish, but our food arrived and we dug right in. My mouth is watering just thinking about it. (I feel like Pavlov’s dog. Every time I think of that meal, I start salivating.) The chicken was tender and the grilled vegetables were so juicy. The tomato vinaigrette had small chunks of tomato in it and combined with the black rice, pine nuts and vegetables, gave your taste buds a burst of flavor. My husband ordered the mahi mahi and enjoyed the zesty tang of the coconut-lime sauce accompanying the fish. We gobbled up our food so quickly, we had no room in our stomachs for dessert. However, my husband said he would definitely order the Baileys and Jack Daniel’s Mousse should we eat there again. Overall, I enjoyed the meal immensely. The atmosphere was calm, the scenery stunning and the food delicious. It was a very positive experience and I highly suggest checking this gem out during your next visit. 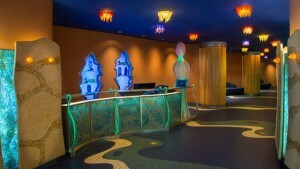 Tables in Wonderland and the Disney Deluxe Dining Plan are both accepted here. Finally, if you’re in the right place at the right time, you may experience a very special surprise during your meal at Coral Reef. Disney World guests who are SCUBA-certified can choose to experience Epcot DiveQuest (check out my review here). This is a 3.5 hour tour giving those who sign up the opportunity to scuba-dive in the tank. 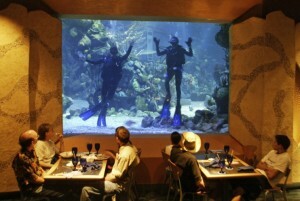 While dining, you just might see one of those scuba divers come up to the glass window and wave to you! It’s such a cool experience for both parties, and is something I hope to see one day should I dine here again! Have you dined at Coral Reef Restaurant? How was your experience? Let me know in the comments! Last time I went to Epcot this was on our short list. Although we chose somewhere else I am wishing we ate here! I think next trip this will be our place to eat. I hope you enjoy it Stephanie. It was such a great experience! I’ve eaten there twice, most recently this past January. DH and I requested (and got) a table right by the tank. I really like fish, and I ordered the mahi mahi. The waiter told me that was their most popular dish. I can see why…it was delicious! If you like fish, I would highly recommend the mahi mahi. All ten of us loved everything we ate. I’m glad you had a similar experience. We have eaten there for the first time in October and were really happy with our meal and the surrounding. I’m so jealous! I would LOVE to see the divers. I hear Mickey makes an appearance sometimes too. How special would that be? Reading about your meal makes me hungry. I’m definitely ordering dessert next time! P.S. Love your comment about eating their relatives! This has always been a favorite of ours. But for the last two visits – April and December, 2014 – it was really off. Both the food and the service were sub-par. We’re laying off this one for several visits until we hear that they are consistently good again. That’s too bad. I hope they make the necessary improvements before the next time you dine. It’s just such a cool atmosphere! The article would have been way better if you showed some foodie picks!